Another one from the archives. Expect more of this rubbish until I run out, then I’ll post some scathing reviews about DC’s #0 issues. There’s a Whole Lotta Lindeloff in the public eye at the moment, with Star Trek burning up multiplexes and Lost’s fifth season perplexing the hell out us. 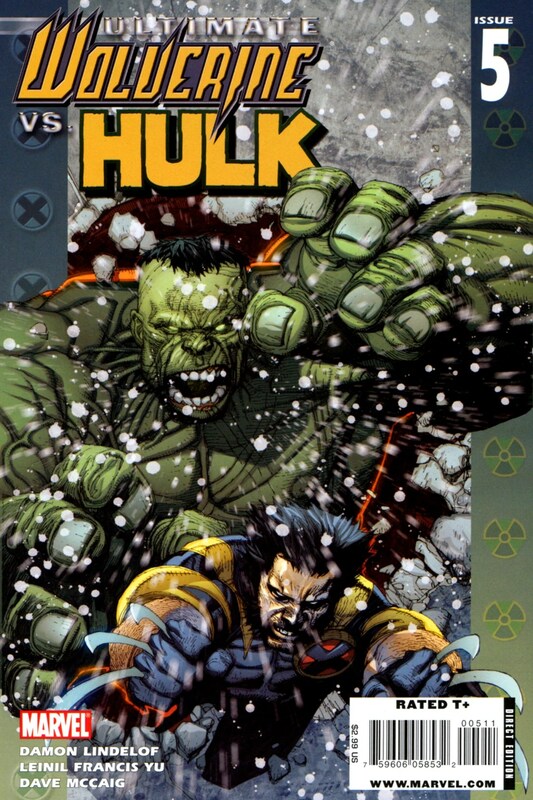 So it was a shrewd move for Marvel to resurrect the Ultimate Wolverine Vs. Hulk series that stalled back in 2006. Oh yeah, and there’s apparently a Wolverine movie out at the moment too. Ahem. currently trashing everyone and everything with a big flood (ie, pressing a big flashing red button called RESET), but because of the hideously erratic schedule for UWvH, it comfortably stands apart from the ongoing monthlies. The latest issue, #5 of 6, is quick to change the style and pace of previous entries with such weird and wonderful chapters as ‘Part One: In Which Logan Pisses Off A Panda’. Lindeloff is great at writing punchy dialogue and delivering the action up in spades; it’s also funny to see one of our cuddly friends tear into the guy with the daft hair like he’s a cheeseburger. #1 saw Wolvie getting his legs torn off by one very angry Hulk; in ish three Lindeloff introduces Ultimate She-Hulk — a super-powered Betty Ross. It’s a fanboy-for-the-fanboys affair, but with Leinil Yu (Secret Invasion) providing some jaw-dropping, career-best art, you can’t help but be swept along with the energy and sheer fun of it all. Fingers crossed that we’ll see issue six on the shelves before 2012 when the world ends.